"Hey Mom, how can dead people walk around New York like that?" Liv asked her mother from the passenger seat of their mini van. "Whoa Brayan, what are you saying? Are you some kind of lie detector in human form?" she asked in amazement. "Yeah, I guess so." he acted as if it was no big deal. "Ok. So, for example, if someone is lying you are able to detect it because their heart rate speeds up or because their palms get sweaty?" she clarified. She still couldn't believe what she was hearing. "Wow, Brayan. This is really cool." she smiled, proud of him. "Yeah." he sighed. "It's great to be able to know when everyone is lying to you when they tell you thinks like...You are a great kickball player Brayan... Lie... You're fun to be around Brayan.. Lie... You're story was really interesting Brayan... Lie... You're my best friend Brayan... Lies, lies, lies! I hate it!" he finally broke down and began to cry. For the most part of the book the narrative voice belongs to Liv. At first glance you could think she's just an ordinary girl, preoccupied with normal teenager day-to-day problems and dramas, like figuring out whether her feelings for her best friend are anything more than a friendly affection or doing her best to fit in at her new school. Pretty much all the things we all could relate to. But Liv is no ordinary teenager, she is an Oracle of Earth, one of four human-born Oracles, who's duty is to save the Earth from destruction. Her companions of Spirit are: athletic and super handsome Laith (Oracle of Fire), adorable computer geek, Brayan (Oracle of Wind) and knowledgeable and organized Meena (Oracle of Water). Each of them has unique gifts and charms, that will help them fight the evil Aengels and Daevas and try and stop them from stealing human souls. I absolutely loved the first part of Soul Quest trilogy. I got sucked into the story from the very first pages of the book and I often found myself thinking about it even when I wasn't reading it. It's such a pleasurable read! At first I was a little bit overwhelmed by the magnitude of the world Amy created, but after a while it all come together, every piece fell into the right place. I'm deeply amazed at how much work the author put into creating a whole new mythology for the purpose of the story, it's jaw dropping. Amy Jones does a superb job of drawing you in. She created an amazing, unique and fascinating world, filled with fantastic, well developed and likable characters. If you liked Cassandra Clare's Mortal Instruments series then I can guarantee you will LOVE Soul Quest! Thanks for the review! I know what book I want to read next! hi Evie! first, thanks for stopping by my blog and for your happy thoughts. second, thanks for following. i returned the love as well and included your blog's link to my buddy bloggers' list. i also subscribed to your feeds. i read YA books too and your review was great! 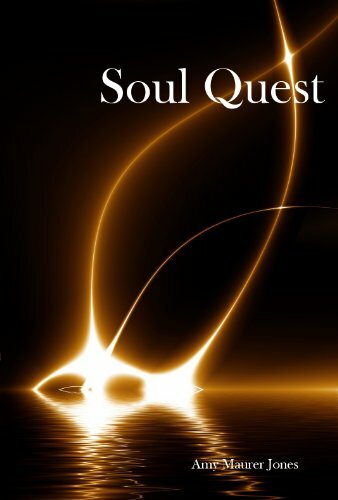 Soul Quest must be a wonderful read. i would have to look into this one. This sounds like an exciting book! I LOVE the quotations you gave us. They're hilarious!! (though poor Bryan... always hearing people's lies. It sounds handy, but at the same time it's a curse). I agree with ABookVacation. Your reviews are so... amazing (I can't think a good enough word!). I'm going to end up buying all the books you review. LOL. This sounds SO great! How come I have never heard of this series before? And the cover is gorgeous! The main heroine sounds like a likeable girl, so I am definitely going to read this. The summary of the book is so great, it draws you in and you immediately want to read it and find out what happens (well, at least I do, lol). Thank you for introducing me to this series and a really nice review! Like the review . love a book that you can put down. the author is probably super excited about this review! i read a sampler from it and it was nice! I love Cassandra Clare's TMI! Anyways, this sounds like a great read, and it's easy to understand what the main character is feeling because we've all been through that stage where we're scared of that first year of high school. I loved The Mortal Instruments series! If this is anything like it, I can't wait to find a copy. I think this may be a good starter book for this type. Sounds like a worth while read. Thanks for the review. I was drawn to the cover! The premise is definitely interesting. How many times have we felt inferior to that girl at school who's perfect at everything? I've never heard of this book before, but it sounds absolutely fantastic and captivating. I'll definitely be adding it to my to-read list. Thanks for the review! I am not entirely sure why, but I really like the cover. It is so simple, but the way the light bounces off of the water and back into the darkness is awesome. The blurb itself drew me completely in, and made me want to go buy this book right now. After your review, I think I may just do that. Thanks so much for another fab review! I could feel your excitement of the book in your review. I have had this book on my kindle but haven't gotten around to it. Thanks for the review! I kicked up this book in rank on my tbr list.